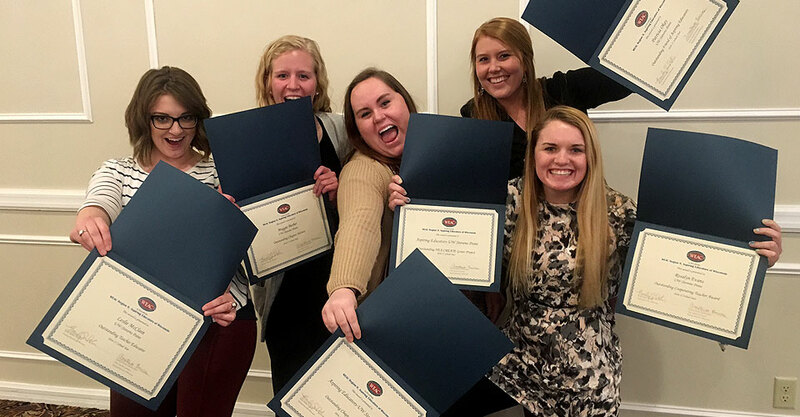 The UW-Stevens Point Chapter of Aspiring Educators (formerly Student Wisconsin Education Association) received six WEAC Region 9 Aspiring Educators of Wisconsin awards at the April Representative Assembly and Leadership Training in Wisconsin Dells. Each award required a paper and two letters of recommendation. The friend of Student WEA Award recognizes individuals that support Student WEA local chapters and/or state events and may or may not be affiliated with WEAC. The Outstanding Cooperating Teacher Award recognizes an individual that provides valuable guidance and continuous support to a Student WEA member during a classroom or student teaching placement. The Student WEA Teacher Educator Award is designed to recognize an individual Teacher Educator for his/her dedication and leadership to his/her students. The Student WEA Outstanding Chapter Advisor Award recognizes an advisor for dedication and service to the local chapter. The Student WEA Outstanding NEA CREATE Project Award recognizes exceptional projects that involves members in affecting Teacher Quality, Community Outreach, or Political Action. You must write a NEA CREATE Grant to apply. The Student WEA Local Chapter Excellence Award recognizes local student chapters that have achieved excellence throughout the year by providing members with leadership and professional development opportunities that reflect the Student WEA Focus. For judging purposes, applications will be divided into two groups based on membership – 100 members or less and 101 members or more.